Your AC system has the important task of keeping your home comfortable on hot days, but an aging or malfunctioning system doesn’t perform the way it should, leaving your home uncomfortably stuffy and wasting valuable energy. Watching for certain signs that your AC system is becoming inefficient or in need of repairs helps you address the problem as soon as possible and restore comfort to your home. The experts at Whipple Service Champions have extensive experience in performing AC repair in Salt Lake City, and we’ll get your system back up and running its best. This sign may not be incredibly obvious until the weather turns significantly hot, but as soon as you begin to notice warm air coming from your AC, it’s time to have it checked out. When your system puts out warm air instead of cool air, it could be an indication of a refrigerant leak or failed compressor. If you find that your AC system is still producing cold air, but not much is coming out, it could also be a sign of a problem with the compressor, or it could indicate a duct or filter issue. The thermostat is responsible for telling the AC how much cool air to put out and how long it should run. If you notice that your AC turns itself off after only a short time or it simply won’t come on, it’s an indication that the thermostat isn’t working properly. If the smell coming from your AC is musty, it could be an indication of mold in the unit or ductwork. Due to the health hazards associated with mold, this is an issue that needs to be addressed as soon as possible. If the odor coming from your AC is more pungent, it could be an indication that the wire insulation within the unit has burned out. If you begin to notice that the air in your home is more humid than it should be, it’s an indication that the AC isn’t performing its job as efficiently as it should. Banging, squeaking, grinding, or scraping sounds coming from within the unit typically point to a belt that has slipped out of place. This is a serious problem that needs to be addressed immediately. If the unit continues to run with a slipped belt, it could seriously damage other parts of the system. There are several potential causes for this issue, but if you’ve noticed an increase in your electric bill that isn’t associated with running your system more often, it means the system is in need of either repair or replacement due to age. Moisture around your AC system could point to a water or refrigerant leak. Water leaks around the system may be caused by a blockage or break in the tube that disposes of condensation and may result in water pooling on the floor around the system, or there may even be ice on the refrigerant lines. You don’t have to wait until something goes wrong to have your AC inspected or maintained. By having your unit inspected, serviced, and cleaned once a year, you can prevent or detect problems before they have a chance to get worse and become costlier to repair. 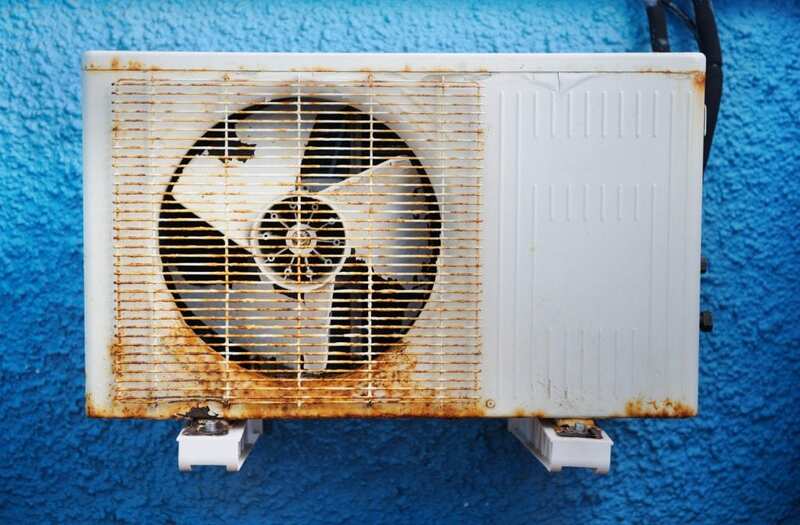 Avoiding this necessary step to keep your AC clean and well-maintained in an attempt to save money often results in having to shell out more money for repair costs in the future. In the course of doing its job, your AC system accumulates dust and dirt in areas that affect its ability to operate at peak efficiencies, such as the air filters and condensing coils. Failing to perform regular maintenance and cleanings can result in your system losing up to five percent of its operating efficiency each year. It can also result in poorer air quality and decreased air flow. Besides the benefits of reduced energy bills and cleaner air, having your AC regularly cleaned and inspected extends the life of your AC and minimizes the need for more frequent repairs. If your AC is experiencing problems that are costly to fix, such as needing a new compressor, and it’s also more than 10 years old, you may want to consider just replacing the system. This is also true if you’re noticing an increase in your energy bills. An aging system simply will not perform as efficiently as a newer one, even if it has been maintained properly over the years. If repairs are becoming more frequent and/or costlier, you may want to consider investing in a new AC. Purchasing a new system is more economical in the long run than making frequent repairs to an old system. This particular type of Freon is being phased out by the federal government and being replaced by refrigerant that is less harmful to the environment. Newer units are already designed to operate on the newer refrigerant, but if you have an older system that is experiencing R 22 Freon leaks, you may want to consider upgrading to a newer system in order to avoid skyrocketing costs of R 22 Freon. As production of R 22 Freon decreases, it will become costlier to acquire over time. If you’re experiencing problems with your AC not cooling your home properly, even though it’s properly maintained, it’s an indication that your system is not the right size for your home. If your system is aging or experiencing problems on a regular basis in addition to being the wrong size, it’s the perfect time to upgrade to a system that is a better fit for your home. It’s possible to get many great years of service out of your AC system with proper inspections, maintenance, and repairs. When unexpected problems occur with your system, contact Whipple Service Champions for fast service you can count on. We provide upfront pricing so there are no hidden costs or expenses. Whether you need a routine inspection or cleaning or need a problem diagnosed and repaired, we keep your system running smoothly and restore it to proper working order. The next time you’re searching for the “best AC repair near me” contact the experts at Whipple Service Champions for all your AC repair needs.